Boost your metabolism with this naturally based, thermogenic weight loss formula! Our Ultimate Thermofit has amazing antioxidants, such as superfood acai berry and the metabolism-boosting properties of Capsimax® (red hot pepper blend). 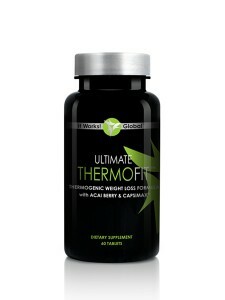 The Ultimate Thermofit is a unique formula that is designed to help you get to your desired weight naturally with no stimulants. This is done by using a patented pepper blend called Capsimax® that starts thermogenesis which increases the rate your body burns calories. Capsimax works in synergy with raspberry ketones and acai berry to help your body increase its metabolism and turn you in to a calorie-burning machine! Thermofit helps to boost your metabolism, reduce appetite, and provide energy. You will be surprised at how well Thermofit works. I take one Thermofit before each meal and feel no need to snack in between meals! This is a great companion product to the Ultimate Applicator and the Fat Fighters.